This is the final installment in Stieg Larsson’s Millenium trilogy, and Larsson’s final word too. His untimely death (that’s a bit Shakespearean isn’t it?) means that we are in for no more…. I was disappointed in much of the first three quarters of the novel. I grew to love Lisbeth Salander in this series – what a great literary heroine she turned out to be – and she remains far too silent for much of this book. 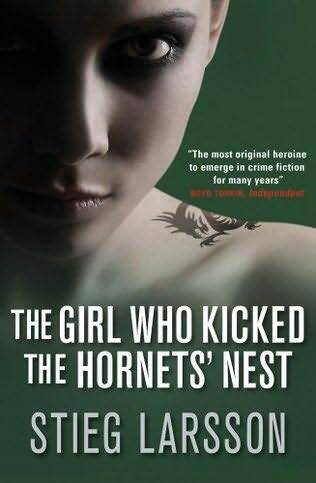 The Girl Who Kicked the Hornet’s Nest takes up directly after the end of The Girl Who Played With Fire – with Lisbeth lying in hospital after being shot in the back of the head. She makes a slow but steady recovery and thus her actions are limited to her hospital bed and the access to the internet that Blomquist manages to give her on the sly. But all around her, a tempest is brewing. The secret agents protecting her father attempt to have Lisbeth put back into a mental institution, and it is up to Blomquist and a few new characters to save Lisbeth from this fate. Far too many plot details and explantion mar the pace of the text, with in depth explanations of all the hows and whys. I know this will appeal to some, but I found myself skimming over chunks looking for the good stuff. I liked the ending though – while not expected it manages to be both fitting and not cheesy at the same time. If you haven’t gotten into this series yet, you have been missing out.